When she won the 2012 contest, Nicole was the General Manager of Gjelina Take Away. Now she is the Pastry Chef at both Gjelina and Gjelina Take Away in Venice where she bakes pies every day. This year she’ll be judging YOUR pies, so click here to enter and impress Nicole. If you feel confident wielding a rolling pin, try making Nicole’s Pork and Peas Pie that won both Best Crust and Best in Show last year. 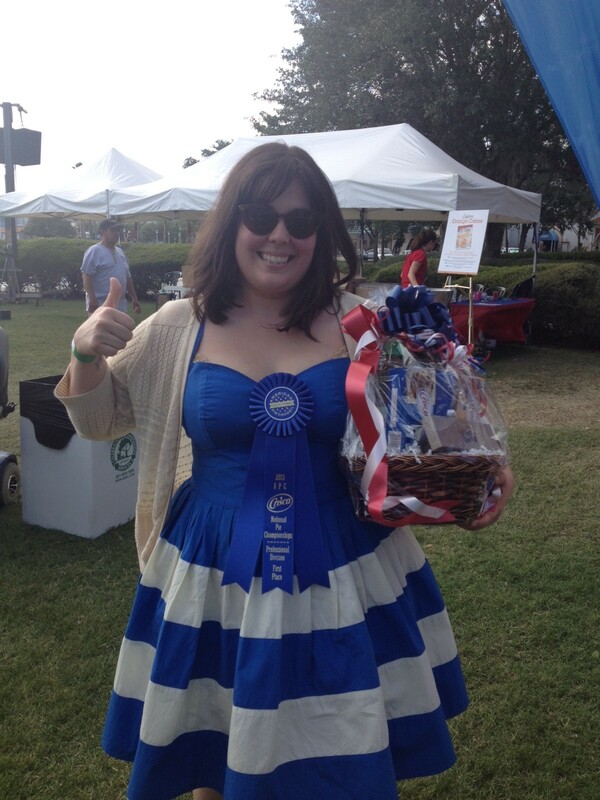 Here are some of her tips for getting your feet wet in pie competition. If you’re making a fruit pie, buy your fruit from a farmers market. It will cost more, but it’ll be worth it. For beginners, nectarines are better than berries. Berries might burst apart and make your pie wet and runny. Another thing about nectarines: They make better peach pies than peaches. You have to peel off the peaches’ fuzzy, tannic skins, which is annoying. You don’t have to peel nectarines to bake with them, and their acid content contributes to a much richer flavor than the mellow sweetness of peaches. All-butter doughs are easier for beginners. And the caramelized milk proteins add a beautiful color. Use your food processor to mix the dough, and then your hands. Make sure all your ingredients are super cold. Using the food processor, cut the butter into the flour until the pieces of butter look like small beads. Then put the dough into a bowl and use your hands to smash the butter more. Once it’s all mixed, make a well in your dough, and add a third of your liquid. Mix it in, fluff and the dough, and add another third of the liquid. Mix and fluff again, and pour the rest of the liquid on top. Make the dough into a log. Wrap it in plastic wrap and let it get cold in the fridge. Don’t get stuck on baking a pretty pie. Nicole says that some of the best pies she’s eaten have been the ugliest. The best pies “speak to the person who made them. That’s beautiful in its own way”. One point about appearance that does matter: don’t use white peaches or white nectarines. They turn grey when you bake them. And that’s just gross. Consider baking a savory pie. The judges will be eating a lot of fruit.